MySQL is the #1 open source database. Oracle Cloud is a complete, integrated cloud and provides a wide range of services across Software as a Service (SaaS), Platform as a Service (PaaS), and Infrastructure as a Service (IaaS). Oracle PaaS provides Oracle Database and MySQL Database services in the Oracle Cloud. Oracle MySQL Cloud Service is a simple, automated, managed service that is enterprise ready. Oracle MySQL Cloud Service is a scalable, highly available, and secure service that provides all the features and management tools that a DBA would need for database administration. 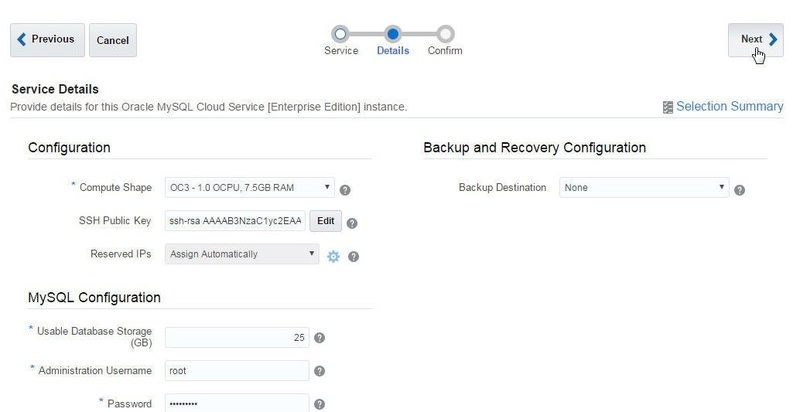 Common DBA tasks such provisioning, patching, backup and recovery, performance monitoring, scaling, replication, and authentication are managed by the MySQL Cloud service. Oracle MySQL Cloud service is seamlessly integrated with other Oracle Cloud services such as Java Cloud Service, Mobile Cloud, Messaging Cloud, Application Container Cloud, and Developer Cloud. Oracle MySQL Cloud Service relies on standard MySQL server tools to load data into the cloud service. A user interface to access the Oracle MySQL Cloud Service and perform data management tasks would be useful management tool. Toad Edge is an all-in-one data management toolset for MySQL database (support for other open source databases to be added). Toad Edge Preview software is available for download here. 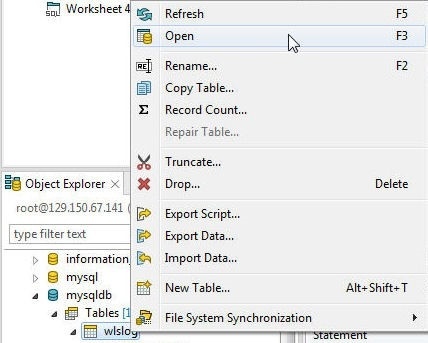 From the Toad Edge graphical user interface (GUI) connect to a MySQL database service in the Oracle MySQL Cloud and create database objects including tables and load data into the tables, or run SQL scripts in a SQL Worksheet to add table data. Table data may be exported to SQL scripts or spreadsheets. Other typical DBA tasks, such as creating users and setting user privileges, may also be performed from Toad Edge. In this article we shall discuss using Oracle MySQL Cloud Service with Toad Edge Preview. This article has the following sections. A My Services URL is also included in the email message sent on the activation of an Oracle Cloud user account. To log in to the Oracle Cloud services open the My Services URL in a browser and provide the username, password and identity domain. The Oracle Cloud provides several services; the service that includes MySQL database is the Oracle Database Cloud service. Oracle Database service is available in various subscription formats: Metered Services, Virtual Image, Non-Metered Services, and Non-Metered Virtual Image. Detailed information about the various Oracle Cloud services is available on the free trial page at https://cloud.oracle.com/tryit. Download and install Toad Edge Preview from http://www.toadworld.com/products/toad-edge/. Supported OS are Windows and Mac OS X. 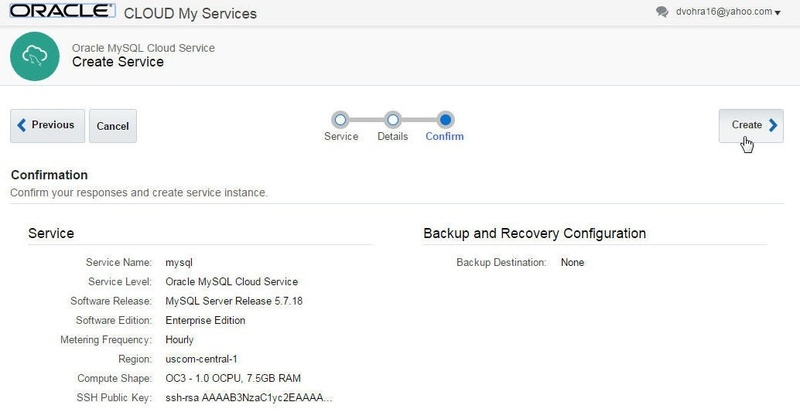 Select the Oracle MySQL Cloud Service in the Oracle Cloud My Services. Click on Create Service as shown in Figure 1. Specify a Service Name (mysqldb), select a Datacenter Region, and select a Metering Frequency as shown in Figure 2. Region may be selected as “No Preference” if a specific region is not to be provided. Click on Next. In Configuration select a Compute Shape, which is the resource description for the CPU and RAM to use, as shown in Figure 3. Click on Edit to create & download a SSH Public Key for VM Access to the service instance. 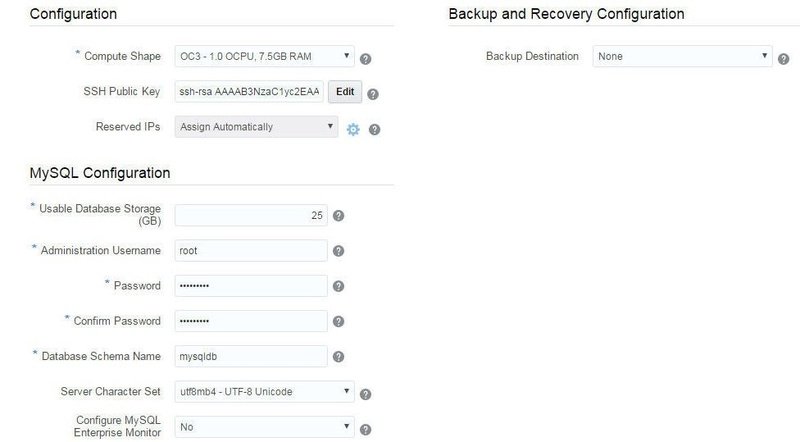 Select Assign Automatically for Reserved IPs and select None for Backup Destination. 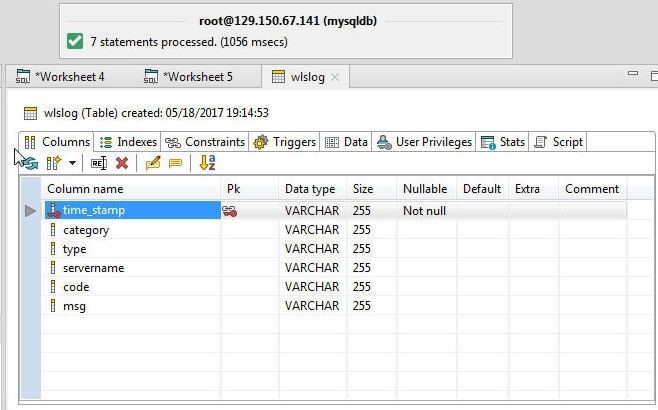 Select default settings for MySQL Configuration header fields usable Database Storage (25 GB), Administration Username (root), Server Character Set, and Configure MySQL Enterprise Monitor (No). Specify a Password, which must consist of at least 8 characters and include one lowercase, one uppercase, one number, and one special character. Specify a Database Schema Name (mysqldb). Click on Next on the Service Details page as shown in Figure 4. On Confirmation page click on Create as shown in Figure 5. Initially the Service Status is “Creating Service..” and the MySQL service after being created is shown in Figure 6. Click on the service link to list the service detail, which includes Service Overview and Resources as shown in Figure 7. Before being able to use the MySQL Cloud Service external access to the service must be configured or enabled. Click on the Manage service icon for the service and select Access Rules as shown in Figure 8. The Access Rules indicate that public access to the MySQL database port 3306 from PUBLIC-INTERNET is not enabled. Click on Actions as shown in Figure 9. Select Enable as shown in Figure 10. In Enable Access Rule click on Enable as shown in Figure 11. Public access to MySQL database port 3306 gets enabled, as shown in Figure 12. Similarly, enable public access the Enterprise Manager as shown in Figure 13. In this section we shall connect to the MySQL Database instance running in Oracle MySQL Cloud from Toad Edge. But first, we need to obtain the connection detail for the MySQL Cloud service. In the Service Overview, which may be displayed from the mysql service link, copy the Connect Descriptor as shown in Figure 14. In the Toad Edge click on Connect>New Connection as shown in Figure 15. 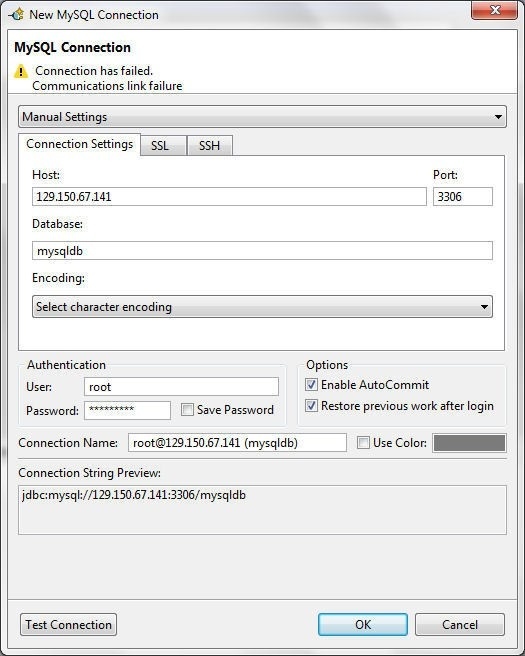 In the New MySQL Connection specify the Public IP from the Connect Descriptor in the Host field. 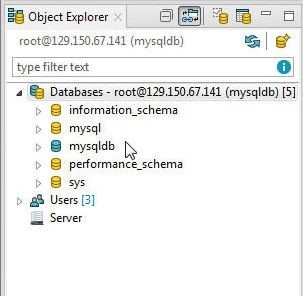 Specify the port 3306 in the Port field and specify the database instance (schema) name mysqldb in the Database field as shown in Figure 16. In Authentication specify User as root and Password as the password configured when creating the MySQL Cloud service. In Options, Enable AutoCommit and Restore previous work after login are enabled by default and should be kept as such. The Connection Name, which is generated automatically, must be unique. 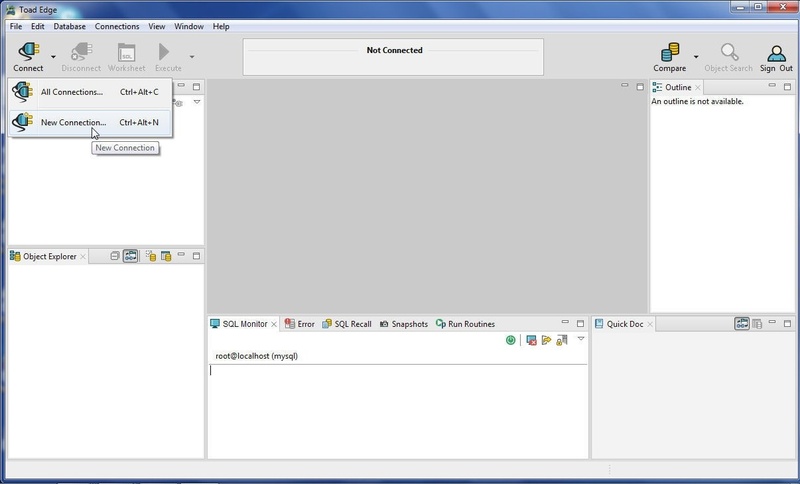 The Connection String Preview lists the connection URL for the MySQL Cloud service database. Click on Test Connection to test the connection. If the connection gets established, a message "Connection is OK" gets displayed, as shown in Figure 16. Click on OK as shown in Figure 17. 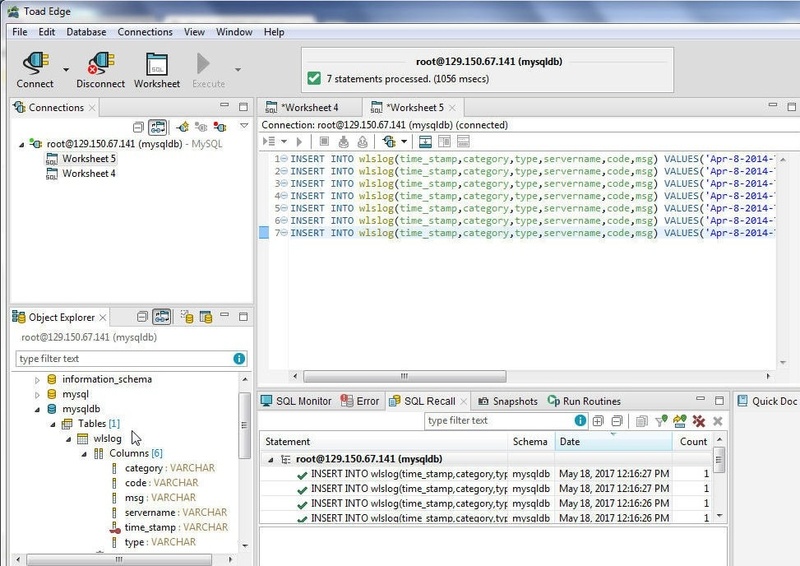 A connection to the Oracle MySQL Cloud database gets created in Toad Edge and gets added in Connections, as shown in Figure 18. 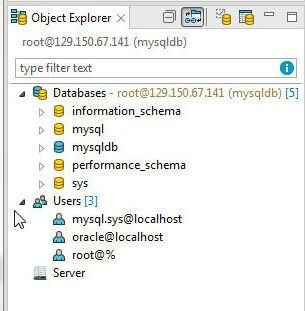 The active database is the mysqldb database, which is configured when creating the MySQL Cloud service, as shown in Object Explorer in Figure 19. The Users are also listed in the Object Explorer, as shown in Figure 20. When configuring the connection, the error “Connection has failed. Communications link failure” could get generated, as shown in Figure 21, even though all the connection parameters are configured as required. The error message is due to the network public access not being enabled to the MySQL Cloud service. Enabling public access is discussed in the previous section. 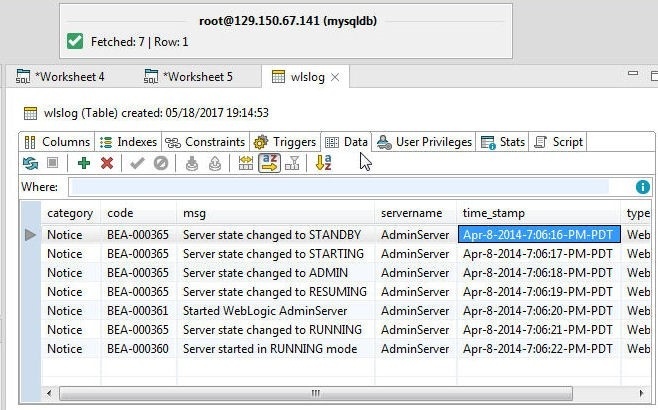 After creating a connection to Oracle MYSQL Cloud service in Toad Edge, a database table may be created using a SQL Worksheet. One Worksheet is added by default when a new connection is created. Copy the following CREATE TABLE statement to the SQL Worksheet. 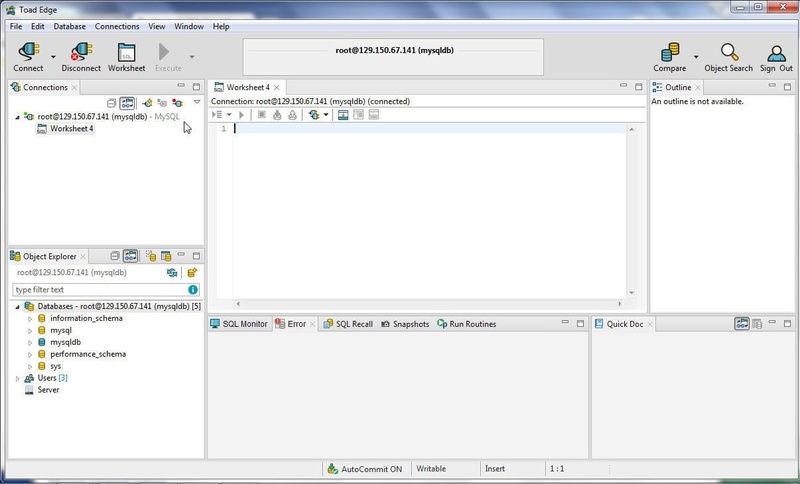 Click on Execute SQL Statement as shown in Figure 22. A database table gets created, as indicated by the message in Figure 23. Next, open another SQL Worksheet from the toolbar as shown in Figure 24 to add data to the table. Copy the following SQL script the worksheet. Click on Execute All Statements as shown in Figure 25. Database table wlslog gets created and gets added to the mysqldb schema, as shown in Figure 26. Right-click on the wlslog table and select Open as shown in Figure 27 to open the table. Tabs for the wlslog table Columns and other attributes get displayed, as shown in Figure 28. To display the table data, select the Data tab as shown in Figure 29. In this article we discussed using Oracle MySQL Cloud service from Toad Edge 1.0. First, we created a MySQL Cloud service and enabled public access to the MYSQL port. Subsequently we connected to the MySQL Cloud database from Toad Edge and created a database table.